After a few incarnations of my website (and a few years of neglecting it), I’m reviving it now as a blog. Why? Well, teaching people how to garden has slowly become my raison d’être, so a blog seems the most sensible sort of website, pedagogically speaking. What’s that tree? It’s the callery pear. 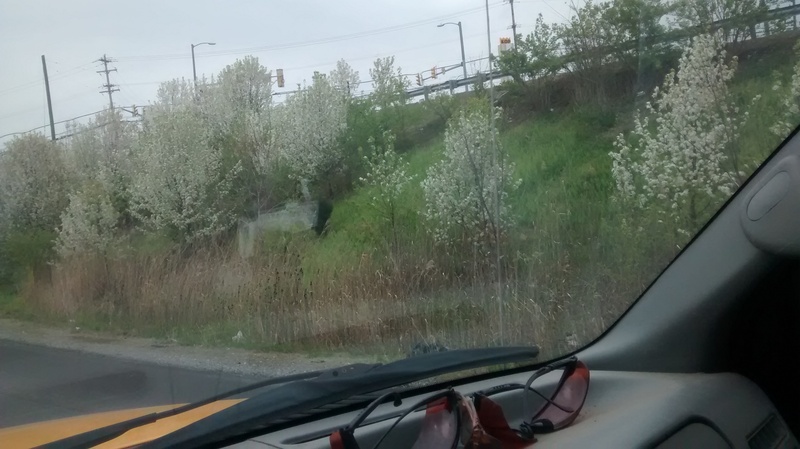 Every year around now people ask me what those beautiful white flowering trees they see along the highway are. The answer: they are the callery pear (Pyrus calleryana). To answer the followup question: no they are not native, and yes, they are an invasive species. The callery pear is a popular landscape tree which is still favored by landscape designers for their nice floral display, nice fall color, and toughness (the brand-new Wegman’s in Pheonixville has them in the parking lot). They’ve fallen out of favor in Philly as a street tree, because the most popular cultivar (‘boulevard’) has a habit of shedding very large branches on parked cars, powerlines, and (oh yes) houses. If I were king, planting these things would be banned, but I’m not, so go ahead and plant them if you really want to (but honestly, folks, the pear trees that make pears for eating are just as pretty, not invasive, and give you tasty fruits). The other followup question is “are they really pears?”, and yes, they are. By late summer a careful observer will see that they’re covered in blueberry-sized, yellowish-green fruits, which hang on the tree after the leaves drop in the fall. They’re not poisonous, but having tried them I can say they’re pretty bland, and very seedy. Someone who’s not me might try making jam out of them some winter (people who make jam get bored in the winter, after all). Just to re-iterate (send me some hate mail, grammarians! ), this is an invasive species. The national park service (which does its best to take care of Valley Forge, as you may know) doesn’t like them one bit. They’re said to spread via birds that eat the fruit and poop out the seeds, but I suspect they also spread via deer poop (I know for sure that goats love the fruits, so presumably deer like them too), and via wind along roads (the little fruits bounce quite well). Of all the fruits we grow here on the farm, the peaches have become my favorites. The trees have nice foliage, excellent fall color most years, beautiful flowers in early spring, and of course the delicious peaches. I grow without using any sprays at all (including the “organic” sprays), and have gotten nice crops every year except for the 2013 season when it never stopped raining long enough for the fruits to dry out. On the farm I use them as “anchor trees” in the raised beds, originally on 12 foot spacing but I went to 24 foot spacing for planting after the 2013 experience. When planting peach trees, always start with a small tree, 2″ caliper or below. Peaches are very fast growers, and need to be trained when young to suit your needs, and will begin bearing very quickly: a fall planted tree can even bear 3 or 4 peaches the first growing season, and provide quite a harvest in the second year. As I learned in class, “plant peaches for yourself, pears for your children, and apples for your grandchildren”. The choice of cultivar is mostly a matter of personal taste. Like any fruit tree, they may bear a bit better if you have 2 or more varieties, though they are self-fertile so it’s okay to plant just one clone if desired. The only peach type I recommend against are the “saturn” or “doughnut” peaches, since their shape tends to allow more moisture to build up and therefore they’re more prone to brown rot. Peaches absolutely need a heavy (almost “brutal”) pruning every winter to control the size and ensure good air flow through the branches. For size, make sure to keep the tree short enough so that you can reach all the branches because you’ll need to thin the fruits, and of course harvest them when they’re ripe. Pole harvesters aren’t a good idea for peaches if you want to pick them fully ripe, because they can be easily bruised at that stage. The center of the tree can also be hard to reach, so any branches going upward in the middle can simply be removed. Prune off any damaged or discolored branches, making sure to remove them from the area when you’re done in case there are any disease spores, then begin thinning the branches. When you’re done, you should be able to easily pass your arm between any two branchlets. Also prune back the tips past where the floral buds are, the tree will grow plenty of new leafy branches once spring arrives. When you’re done, you will have removed about half of the bud-bearing branches. In early spring, thoroughly clean up under the tree, making sure there are no twigs, leaves, or pits which might have disease spores. Be on the lookout for songbirds building nests: nesting birds make a mess, knock the fruits off, bring in materials you don’t want to be there, and depending on the species might attack you while you’re trying to thin the fruits. (Don’t worry, if you remove the nests early in the construction phase, the birds won’t be set back badly and will just build another one somewhere else). When the flowers arrive, sit back and enjoy them. A few weeks later, look for the little fruits. Once they’re just a bit bigger than a marble, it’s time for the first thinning. If you want edible peaches, you need to thin the fruits, because these trees produce far more fruit than the tree can reasonably support. On trees that haven’t been thinned, there will be large numbers of very small fruits that are mostly pit with just a little flesh (and if they haven’t been pruned either, the fruits will all get brown rot and only the yellow-jackets will want to eat them). I’ve found that it works best to thin twice by removing half of the fruits each time, and then monitoring every few weeks for fruits that are too close together. The best thing about growing your own is that you can pick them when they’re fully ripe for eating, or almost ripe for canning. Squeeze like you would a baby’s little finger, and if it give just a little it’s good for canning, if it feels fleshy it’s good for eating right then and there. Yes, this is a blog page, but the blog comment field is the easiest way for me to take comments or questions in general, since I check in for comments once a day anyway. Your comment will not be “approved” for public reading without your explicit permission, and I will respond via email from a sweetbottomfarm.net address.